During the summers, Trump worked for his father's company at the construction sites. He entered Fordham University and then transferred to the Wharton School of Finance at the University of Pennsylvania, from which he graduated in 1968 with a degree in economics. Trump seems to have been strongly influenced by his father in his decision to make a career in real estate development, but the younger man's personal goals were much grander than those of his father. After graduating college, Trump joined the family business, the Trump Organization. In 1971 Trump moved his residence to Manhattan, where he became familiar with many influential people. Convinced of the economic opportunity in the city, Trump became involved in large building projects in Manhattan that would offer opportunities for earning high profits, utilizing attractive architectural design, and winning public recognition. When the Pennsylvania Central Railroad entered bankruptcy, Trump was able to obtain an option (a contract that gives a person the authority to sell something for a specific price during a limited time frame) on the railroad's yards on the west side of Manhattan. When plans for apartments were refused because of a poor economic climate, Trump promoted the property as the location of a city convention center, and the city government selected it over two other sites in 1978. Trump's offer to drop a fee if the center were named after his family, however, was turned down, along with his bid to build the complex. In 1974 Trump obtained an option on one of the Penn Central's hotels, the Commodore, which was unprofitable but in an excellent location near Grand Central Station. The next year he signed a partnership agreement with the Hyatt Hotel Corporation, which did not have a large downtown hotel. Trump then worked out a complicated deal with the city to revamp the hotel. Renamed the Grand Hyatt, the hotel was popular and an economic success, making Trump the city's best known and most controversial developer. In 1977 Trump married Ivana Zelnickova Winklmayr, a New York fashion model who had been an alternate on the 1968 Czech Olympic Ski Team. After the birth of the first of the couple's three children in 1978, Donald John Trump, Jr., Ivana Trump was named vice president in charge of design in the Trump Organization and played a major role in supervising the renovation of the Commodore. In 1979 Trump rented a site on Fifth Avenue next to the famous Tiffany & Company as the location for a monumental $200 million apartment-retail complex designed by Der Scutt. It was named Trump Tower when it opened in 1982. The fifty-eight-story building featured a six-story courtyard lined with pink marble and included an eighty-foot waterfall. The luxurious building attracted well-known retail stores and celebrity renters and brought Trump national attention. Meanwhile Trump was investigating the profitable casino gambling business, which was approved in New Jersey in 1977. In 1980 he was able to acquire a piece of property in Atlantic City, New Jersey. He brought in his younger brother Robert to head up the complex project of acquiring the land, winning a gambling license, and obtaining permits and financing. Holiday Inns Corporation, the parent company of Harrah's casino hotels, offered a partnership, and the $250 million complex opened in 1982 as Harrah's at Trump Plaza. Trump bought out Holiday Inns in 1986 and renamed the facility Trump Plaza Hotel and Casino. Trump also purchased a Hilton Hotels casino-hotel in Atlantic City when the corporation failed to obtain a gambling license and renamed the $320 million complex Trump's Castle. Later, while it was under construction, he was able to acquire the largest hotel-casino in the world, the Taj Mahal at Atlantic City, which opened in 1990. Back in New York City, Trump had purchased an apartment building and the Barbizon-Plaza Hotel in New York City, which faced Central Park, with plans to build a large condominium tower on the site. The tenants of the apartment building, however, who were protected by the city's rent control and rent stabilization programs, fought Trump's plans and won. Trump then renovated the Barbizon, renaming it Trump Parc. In 1985 Trump purchased seventy-six acres on the west side of Manhattan for $88 million to build a complex to be called Television City, which was to consist of a dozen skyscrapers, a mall, and a riverfront park. The huge development was to stress television production and feature the world's tallest building, but community opposition and a long city approval process delayed construction of the project. In 1988 he acquired the Plaza Hotel for $407 million and spent $50 million renovating it under his wife Ivana's direction. 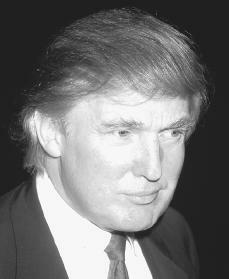 It was in 1990, however, that the real estate market declined, reducing the value of and income from Trump's empire; his own net worth plummeted from an estimated $1.7 billion to $500 million. The Trump Organization required massive loans to keep it from collapsing, a situation that raised questions as to whether the corporation could survive bankruptcy. Some observers saw Trump's decline as symbolic of many of the business, economic, and social excesses from the 1980s. Yet Trump climbed back and was reported to be worth close to $2 billion in 1997. Donald Trump's image was tarnished by the publicity surrounding his controversial separation and the later divorce from his wife, Ivana. But Trump married again, this time to Marla Maples, a fledgling actress. The couple had a daughter two months before their marriage in 1993. He filed for a highly publicized divorce from Maples in 1997, which became final in June 1999. On October 7, 1999, Trump announced the formation of an exploratory committee to inform his decision of whether or not he should seek the Reform Party's nomination for the presidential race of 2000, but backed out because of problems within the party. A state appeals court ruled on August 3, 2000, that Trump had the right to finish an 856-foot-tall condominium on New York City's east side. The Coalition for Responsible Development had sued the city, charging it with violation of zoning laws by letting the building reach heights that towered over everything in the neighborhood. The city has since moved to revise its rules to prevent more of such projects. The failure of Trump's opponents to obtain an injunction (a court order to stop) allowed him to continue construction. Blair, Gwenda. The Trumps: Three Generations That Built an Empire. New York: Simon & Schuster, 2000. Hurt, Harry, III. The Lost Tycoon: The Many Lives of Donald J. Trump. New York : W. W. Norton, 1993. O'Donnell, John R., with James Rutherford. Trumped! : The Inside Story of the Real Donald Trump. New York: Simon & Schuster, 1991. Tucille, Jerome. Trump: The Saga of America's Master Builder. New York: D. I. Fine, 1985. Wow - this country is going down the tubes. Anyone who can seriously consider voting for Trump must get of their perspective on life from watching reality TV, infomercials and the Home Shopping Network all day. Sure would be nice if folks would listen and not filter through their prejudices. It would be nice to have an "American" who is not beholden to anyone when they come into office and will just 'hire' people who are actually qualified for their positions. Trump has a history of doing exactly that. We need this country cleaned up before we can help others. Too much dishonesty in government is killing us. We are not respected. If we want other countries to 'love' us again, they need to respect us first and fear us. full of himself. Listen to others and don't think he knows it all and his money makes him better that others. p,s, it may have been Donald Duck that was born in Canada. I am so glad Donald Trump is running for President. I do not care if he has a big ego. I do not care if he offends you. If he is not "correct ". At least he is not a traitor like the two Cubans like Rubio the hispanic Obama who will provide a free pass to million of illegals or Cruz the Bible liar or Hillary the pathetic candidate of the past or expect to win because she is a woman or Bernie the communist. I despise all those politicians that want to step on Trump planing to destroy him on his path to the white house and who criticize people who choose Trump LIKE I DO. This is the land of the free and I am free to choose Trump. And all of you jerks that want to judge my choice talk to my lower back ! I agree with Ariane D that it does not matter if someone has a big ego, or if someone offends, or even if someone is a hole. It does not even matter what a man says, even if his words are hate-filled, vitriolic tirades. What matters is what a man does, and this is critical to the future of our country. l truly understand people wanting to back Trump, because he is screaming that something is wrong here in our country. Many, many, many people: Democrats, Republicans, undecideds, agnostics, Christians, Moslems, Cuban-Americans, Asians, and others of us agree, I think, on that point. So, Trump is right about that. What we must consider is who the person will be to take our country forward, and we must base that on how we think that person will do that. We must read between the lines as we choose. We must recognize also that evil does exist, and that we must always be aware and wary when choosing our leaders. I am highly motivated by this biography and wonder how on earth such immense success would be under the care of such an arrogant Trump. On the contrary, I blame the origin of Trumps grandparents (German) that I believe without doubt carry the Hitler genes. my verdict: Donald Trump is a good stand alone character. Venomous to a republic, arrogant, careless, and simply foolish. He will die never having attained self actualization and head home to Hitler his ancestor. Though it is refresning to see a non politician running for public office, we need to evaluate his true intentions. That is, is he running for president to help the country in it's national as well as foreign policy or is he doing it as another goal he set for himself to reach in his life time. We must all remember that his relationship with Congress is extremely important for changing any policy issues. Should he become President his business acumen may help him. However, the cabinet he's chooses as his advisors will be the key to his successes and failures. Donald Trumps know how of making money will never make him a credible Presidential candidate. He did not even study political science! His ideologies are based on assumptions of cultures, because he is too lazy to look up the facts! America's safety in his hands is a very scary thought; as the only thing I read in this biography is an early sending away to a military school for discipline, not REAL military training! We are living in a day and age where America requires a president who has un- questionable skills, but not even skills are enough, and he demonstrates a lack of empathy for human beings. He feels that respect can be bought respect must be earned, and the same as trust. Based on the way he speaks in his debates, the skills he possesses are rudeness, and racist! It's all so interesting as to what's happening. Trump has been called him every name in the book. Please tell me why Hillery's past doings are not talked about as much? Why are people wanting another Obama by voting for her. Why do people want to vote for either one of two men who are not born in the U.S.? All the nit picking going on it tells me the Republicans are more afraid of Mr. Trump than the Democrats. It's all so obvious if you have speck of grey matter.. I'm offended at the Republican party they must think we are some kind of stupid.I am curious as to why the Republican party wants to see our country fall apart. It makes no sense. Mr.Trump I wish you the best, and thank you for being here for us! I am 16 and honestly trump is a good candid but how do we know , hes going to actually put forth his ideas in reality, I do not want another dictator and i just want everything to go back to peace. I am not old enough to vote i just want to know someone will make a change in society. IM READY FOR CHANGE. i dont like it when he is ignorent and his ego because the world needs another honest Abe . Watching the rise of Donald Trump has been interesting to say the least. I am sort of reluctant to help give this man complete power over the free world, but on the other hand he has unusual gifts to offer this country. Donald Trump is a solid American with much to lose if our country doesn't do well, assuming he takes office. That's sort of an insurance policy the American people can bank on. Business deals within the Middle East, (the area I find to be the most explosive) are calculating, undermining, raw and certainly not "All American". Someone like Donald Trump, as crass as people may find him, I see as having the ability to abruptly negotiate with our adversaries. Dealing in this world can not be done with a "Casper Milk Toast" mentality. Donald Trump's wife has a certain elegance about her; sort of royalty. America could use some royalty, fashion and elegance. Why not run the country like a business. Let us give Donald Trump 4 years to try? He does not have super power but he knows what is needed even if it hurts. Mister President of the United States of America, I congratulate you on your election. You are a man God permitted to be elected to the exalted position to fulfill His mandate. I pray you will succeed in the name of Jesus. Please remember that there is no man of God without the God of man. You success at the polls should be dedicated to God so that you can eventually succeed in office. Be guided by the fear of God and the love for the people. I counsel Mr President to avoid Sodomic errors. I plead that you will defend Godliness in all you do. By so doing, your success is guaranteed and your name will be engraved in divine inscription for eternity. I undertake to continue to pray for you as you ensure that the whole world enjoys security, fairness and sense of belonging during your tenure. No doubt, much is expected from you and I pray you will not disappoint God, your nation, the world and yourself. Again, hearty congratulations to Mr President. My comment is he did not win the election honestly he stole the election in the last two hours on 11, 2016. all you american's out there if anyone recorded the election look at it when the tv went in technical difficult of the last two hours you will see when Hilary Clinton electorial votes was coming in she had 212 electorial votes and Donald Trump had 244 electorial votes . Hilary Clinton electorial votes was coming in when the television began acting up her votes was coming in and stopped all of a sudden and someone announced that Donald Trump had won the election when he had only 244 electorial votes , it was repeated about 3 times when they cut off Hilary Clinton electorial votes while they was coming in for her if they had not interupted her electorial votes when they was coming in she would have won the PRESIDENCY and BE PRESIDENT NOW. The election was interupted during the election we saw HISTORY UNFOLD RIGHT BEFORE OUR FACE WATCHING THE ELECTION 11, 2016 and you did not know what was happening right before your eyes not knowing when the television went into technical difficulty. They did not tell you it was going in or having technical difficult because they did not want you to know what was happening that is when they tricked you into thinking Donald Trump had won the election I and others who was watching that night we saw what they did and it had to be an inside job while someone else helping them pull it off but it did not go as they thought but you excepted it when they repeated that Donald Trump had won the election but he did not win it honestly if there is any AMERICAN WHO READS THIS AND RECORDED THE ELECTION 11, 2016 WILL SEE WHAT HAPPPENED ON ELECTION NIGHT HILARY CLINTON WON THE ELECTION. WATCH YOUR RECORDING IF YOU RECRODED THE ELECTION NO ONE CAN CHANGE YOUR RECORDING OF THE ELECTION BECAUSE IT IS YOUR PROPERTY IT WILL SHOW YOU WHAT HAPPENED AND WHO WON THE ELECTION NOT DONALD TRUMP BUT HILARY CLINTON. THE ELECTION WAS INTERRUPTED WATCH YOUR RECORDING IF YOU STILL HAVE IT . WE SAW WHAT HAPPENED THE ELECTION WAS RIGGED. Ms. America. I like trump for what he has been doing for the country because it will keep us safe like protecting babies. I am related to Hilary Clinton (which I hate) and I can firmly say she is the most disliked person on my list (not a big list). The one true God has put him there for a reason which might be good or bad depending on how you look at it. But I am so so so glad that Clinton is not in office for the reason or vaccines, abortions and so much more. That is all. Who is the publisher/author of this particular article on Trump? I don't see how someone could not like him because he is trying to PROTECT our babies NOT KILL THEM. It is a crime to kill and he is trying to put an end to it. I am so so so so glad for that, because if you are fine with that then that is saying that is fine to kill. Yeah you can not like him for many reasons but it is very good that he is stopping things like this. I don't see. he is trying to KILL our babies. It is a crime to PROTECT children. I’m sorry. Yeah. it is very good kill. I pray Jesus. god bless tyrants.